Success isn’t always defined by who has the most AP classes or the highest test scores. Among L.A.’s finest schools are 10 that focus on a specialized curriculum or provide a nontraditional approach to how, what, and whom they teach. Eight-year-old Animo Leadership began as an experiment; it was the first of what are now a dozen schools for at-risk students run by Steve Barr and his Green Dot Public Schools. By creating small, largely autonomous campuses focused on getting kids into college, Barr believed he could achieve results where local educators had failed. Of the original 140 students, nearly all earned diplomas and nearly two-thirds of these graduates went to universities. Today Animo Leadership has reached an enrollment of more than 540, and its success has helped Green Dot gain national acclaim as well as financial backing from Eli Broad and Bill Gates. College remains the priority; readiness classes begin in sophomore year, and everyone must apply to at least three schools and for at least three scholarships. The curriculum includes honors and advanced placement classes as well as literacy and tutoring programs. Nonconformity is a proud tradition at a school known as much for its high-profile parents and alumni as it is for its progressive approach to education. 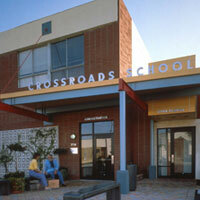 Crossroads doesn’t keep class rankings, teachers are referred to by first name, and AP classes recently were dropped to free students from what upper school director Liz Resnick calls “the tyranny of the test.” From the time it was established in 1971, Crossroads has reveled in being artsy and funky. Its home is a patchwork of converted buildings (in addition to a beautiful library and arts center) anchored by the Alley, a paved area with picnic tables where student bands play during lunch. Over the years the curriculum has expanded to include astrobiology, environmental chemistry, and other sciences as well as languages such as Japanese. Frostig helps what it calls “more complicated” children with learning differences attain a kind of success that isn’t always defined by a college degree. “We want people to have satisfying lives,” says executive director Bennett Ross. That means getting kids to understand their disabilities and develop strategies for coping with them. Job coaches accompany students to work at local businesses. The school’s comfortable classrooms are stocked with tools to address various learning styles, including optical readers, audio books, and “fidget toys.” Frostig offers its own diplomas; it also assists students who want to graduate from their local public schools. Although it’s stuck between the 110 freeway and an oil refinery, HTPA is right where it wants to be—next to Los Angeles Harbor College. It is one of the county’s handful of “middle college high schools,” hybrids designed to challenge advanced students and enhance the college prospects of kids from underserved communities. To do well here requires the maturity to mix with older classmates and to dedicate oneself to long days of commuting and study time. The academy, which was founded six years ago, has broadened its mission beyond training teachers; its graduates, more than 70 percent of whom also earn associate of arts degrees, pursue professions such as business and engineering. With enrollment exceeding 4,600, Long Beach Poly demonstrates that a huge, diverse public school can maintain a national reputation for producing scholars, artists, and athletes. Much of its success grows out of its small-scale “learning communities”—academies that specialize in math and science, the humanities, and business and technology—and its highly competitive PACE and CIC magnet programs, which are major feeders to the University of California system. The Grammy Foundation has honored Long Beach Poly for having one of the nation’s best public school music departments. Its choral students have sung in Saint Peter’s Basilica in Vatican City and at Lincoln Center in New York. Sports Illustrated has named the athletic department tops in the United States because of its record number of championships and its prowess in sending players to the pros. Students can brush up on their British accents and polish their pliés at the only school in Southern California that provides tuition-free, conservatory-style training in dance, drama, music, and the visual arts as well as courses in television, film, and musical theater. Some kids spent years preparing for their admissions auditions, thus creative passions can run high. Even so, mornings are devoted to college prep subjects; students also can take classes at Cal State L.A., on whose campus the school is located. 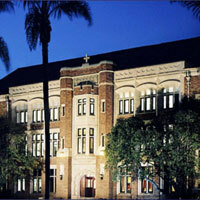 The 143-year-old Jesuit school provides a rigorous education in an environment that is more socially diverse than what you’ll find on most private campuses. Ninety-six percent of Loyola’s graduates attend four-year colleges. Its teams are perennial California Interscholastic Federation contenders in football and cross-country, among other sports. The school is dedicated to developing what it calls “men for others,” who appreciate the value of spirituality and community service. A recent $30 million renovation has added a sleek science center and other facilities to Loyola’s stately grounds near the West Adams District. The tuition of $12,500—about half that of its secular peers—makes the school a relative bargain. Summit View serves college-bound kids with learning differences who test well but might perform poorly in a mainstream environment. The school will not admit anyone who has major behavioral or emotional problems. The curriculum satisfies University of California requirements—a number of graduates have been accepted by the UC system—though it has been modified (algebra is taught in two years instead of one). 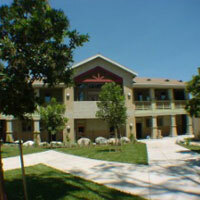 Summit View, which also has a campus in Valley Glen, occupies part of a complex run by the Help Group, a nonprofit devoted to children with special needs. Westmark was started by the Landmark School in Massachusetts, a leader in working with language-based learning differences, but now is owned by a local nonprofit. The school will consider applicants who have conditions such as ADD and ADHD. It offers a modified college prep curriculum and uses a multisensory approach to teaching and learning as well as the Lindamood-Bell reading program. The campus covers four-and-a-half acres and includes athletic fields, a woodworking studio, and a student-run TV station. All 29 seniors in last year’s graduating class went to college. At Wildwood every student performs mandatory “volunteer” work at a preschool or a homeless shelter, and a poor ethics evaluation can hurt one’s final GPA. The school bases its curriculum and culture on “Habits of the Mind and Heart,” principles that promote collaboration, perspective, and community service. Classes favor independent and group projects over daily assignments. To foster a noncompetitive environment, presentations and oral assessments have replaced finals and report cards. Wildwood began as an elementary school in 1971; three decades later it opened its architecturally striking middle/upper school campus nearby, albeit one without an athletic field, so team sports are played off-site.